Welcome to Slovenian Icelandic Horse Association web site! 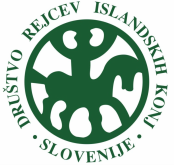 In 1993 the Society of Icelandic Horse Breeders of Slovenia (DRIKS) was established, which links around 80 members and is also one of the nineteen members of the FEIF. The main aims of our association are to provide our members with all relevant information about the breed, to organize different kind of icelandic horse events, popularization of icelandic horses, to maintain the register of breeding and competition horses (World Fengur), to provide educational materials, cooperate with FEIF, and to ensure quality breeding program of icelandic horses in Slovenia. The first two icelandic mares came to Slovenia in 1991 from Denmark. Nowadays, there is about 500 horses in Slovenia and the number of ambitious sport riders who participate National Championships, in Word Championships, Middle European Chanmpionships and WorldRanking events increases. Slovene National Championship has been organised every year, usually in the first weekend in September. National championship is however open for foreign riders too. DRIKS organizes breeding shows too. It is planned to organised breeding show every second year, starting in 2006. Every activities performed by DRIKS continues to be the result of efforts by amateurs, who also provide the financial means for the "Icelandic" movement to prosper. Slovenian Championship 2011 will take place on 4th September 2011!